As a girl who never ever wears make up, I was understandably worried about having to wear some on my wedding day!!! Thankfully I found Nicola and she was amazing, so understanding that this experience was all so foreign to me!! She came to my home about 6 weeks before my big day for our trial, she tried a couple of different looks to make sure I was 100% happy with my look. She also asked me to see what my family thought that day and offered to arrange another trial if I changed my mind about the look she had created! Infact completely the opposite happened and my sister was so impressed when I saw her about how natural I looked she asked me to see if Nicola could also do her make up on the wedding morning! 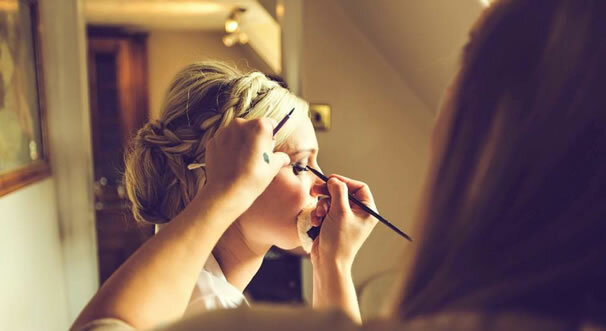 On my wedding day everybody but everybody commented on my make up and how natural it looked and on how well it lasted, I did not need to touch it up at all throughout the day which I was amazed at especially as we got married August bank holiday! I would definately recommend Nicola to anyone who asked as she made me feel very comfortable and confident with the make up (and eye lashes!) that she did for me!! Last month I was Maid of Honour at my sisters wedding, we asked Nicola to do both our makeup due to recommendations from two friends. When Nicola came for the trial, she listened to what I had in mind and made suggestions that would benefit my skin tone etc. Nicola was professional throughout the trial and on the day, putting both my sister and I at ease. The quality of the makeup ensured it lasted throughout the day and I couldnt of been happier with the miracle she performed (whilst not having me caked in makeup). I wouldnt hesitate in recommending Nicola, so if your looking for someone friendly and professional look no further. Thank you for doing such a fantastic job with my makeup and my bridesmaids makeup for my wedding. you were such a calming influence to have around on the morning particularly as I was worrying about the rain! I had so many compliments on my makeup throughout the day, you really did get the balance right so that it looked lovely without being over the top. we havent had the professional photos back yet but when we do I will let you know so you can take a look. If you ever need a recommendation from a happy customer please get in touch, I will definitely be telling all my friends about you when theyre planning their weddings. Thank you so much for the beautiful makeup you did for my daughter sarah and myself. We were so happy with what you done for us. The wedding went amazingly and I will post some photos on your site soon. Ladies out there who want the professional touch then we recommend Nicola, who is a lovely,polite, friendly lady.